Travelers going to Tucson International Airport (TUS) from Tucson’s far eastside should consider alternate routes to avoid possible delays and detours by major road restrictions due to construction around the Valencia-Kolb roads intersection. 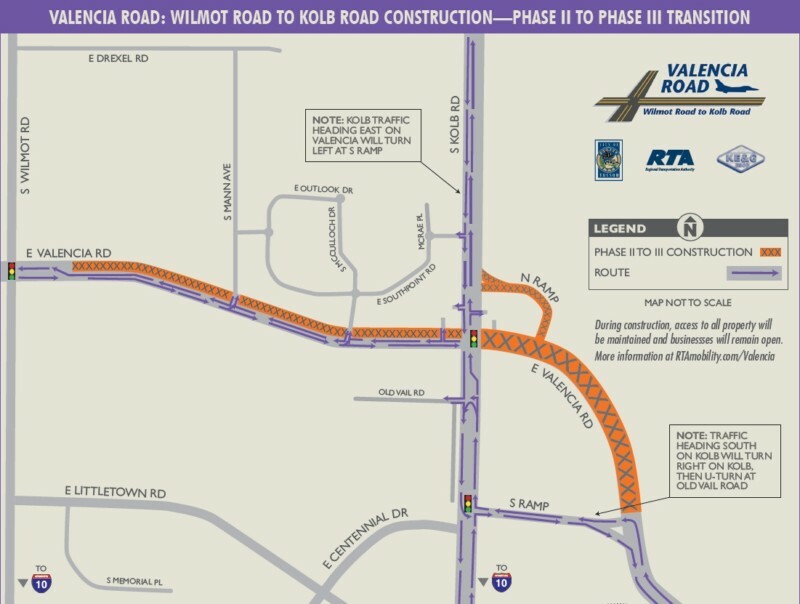 Through at least mid-July 2019, Valencia Road east of Kolb Road is closed entirely and west of the intersection is reduced to just one lane of travel in each direction to Wilmot Road. Additionally, Kolb Road north of the intersection is reduced to one lane in each direction. Golf Links Road east, which transitions to Alvernon Way south. Continue south to Valencia Road and turn right. Go 1½ miles to Tucson Boulevard and turn left to enter the airport. 22nd Street east to Alvernon Way. Turn left, and go south using the transition to Palo Verde Road. Continue south to Valencia Road and turn right. Go 1 mile to Tucson Boulevard and turn left to enter the airport. Houghton Road south to eastbound on-ramp to Interstate 10. Go 8 miles, take Valencia Road exit. Turn left at traffic light on to Valencia Road, go 3 miles to Tucson Boulevard and turn left to enter the airport. Rita Road south to eastbound on-ramp to Interstate 10. Go about 7 miles, take Valencia Road exit. Turn left at traffic light on to Valencia Road, go 3 miles to Tucson Boulevard and turn left to enter the airport.